Kole Nedelkovski was Koco Racin's contemporary, and was born in 1912. Because of the poverty he had to discontinue his education and started to earn for living, working as a house-painter. However, Kole Nedelkovski was very interested in the Macedonian language and read books all the time. Kole Nedelkovski expressed his sympathies towards the workers movement. As Kole Nedelkovski participated in certain activities connected with it, he was constantly banished by the police. Kole Nedelkovski emigrated in Bulgaria, hoping that he can write about any constraints. In Sophia, he joined the "Macedonian Literary Society" and got together with Racin, Nikola Vapcarov, Dimitar Mitrev and some others literary activists. He started to create poetry more intensively and involved himself in a struggle against the fascism. Kole Nedelkovski was killed in a conflict with the Bulgarian police in 1941. 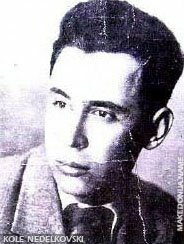 Kole Nedelkovski published only two songs collections "M'skavci" (The Thunderbolts) and "Pesh po svetot" (Walking around the World), which express social and revolutionary ideas. Mainly, his poetry is influenced by the Macedonian folk song. Kole Nedelkovski especially nourished the Macedonian language and in his songs we can notice pure Macedonian language and a tendency of searching and using old Macedonian words.